Listen. We both know that “best practices” don’t mean much. 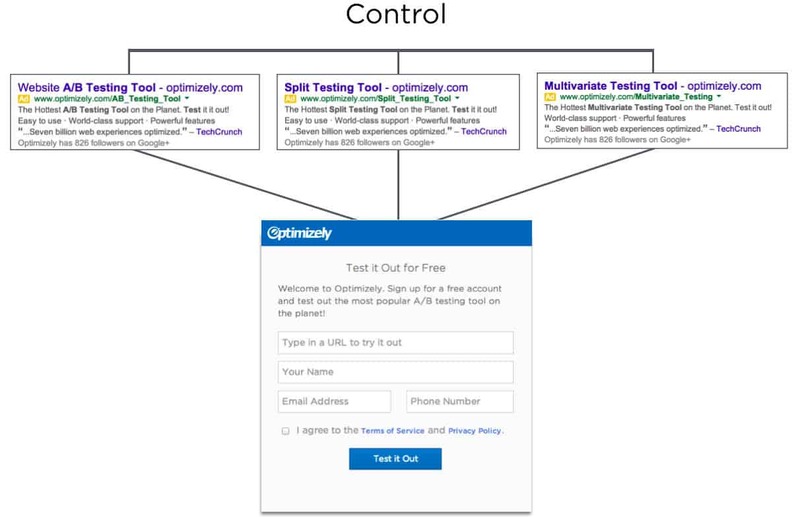 If you aren’t A/B testing, you are leaving a ton of money on the table. 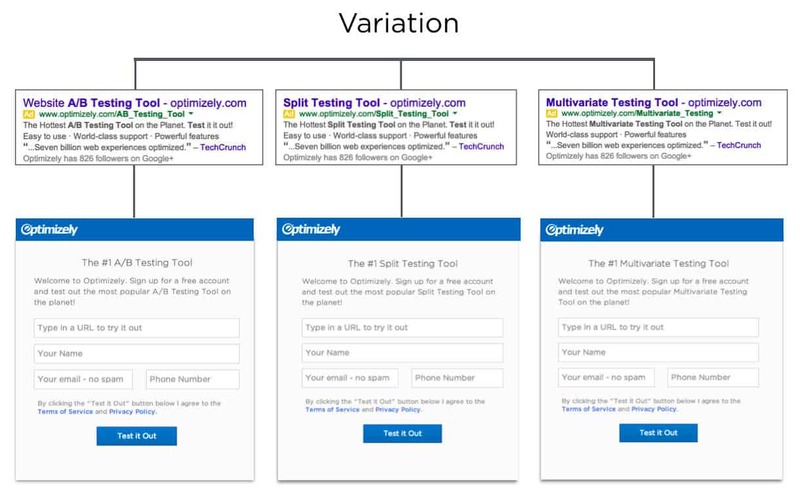 A/B testing is a time-consuming method of optimization. It’s effective, but if you can simply click “edit” and make an obvious improvement, start there. This is why “best practices” can be so powerful. They let you apply what others have learned and get quick wins when nothing is working. Plus, when you begin implementing a solid A/B testing framework, best practices can give you some great hypotheses for your first round of tests. In today’s post, we’ll cover 21 proven best practices, backed up by case studies, statistics, and data. 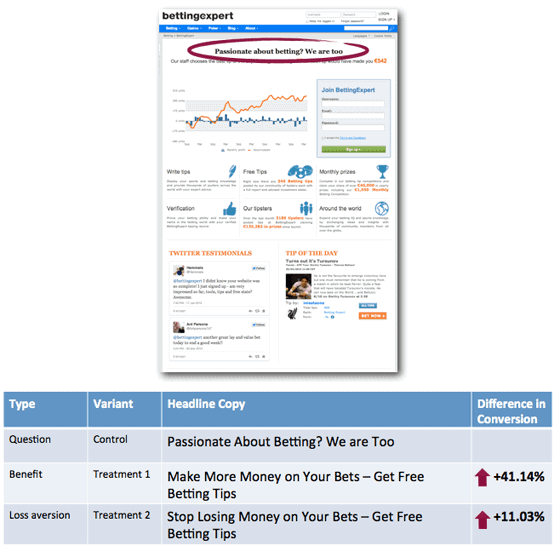 BettingExpert is an online betting forum where tipsters can share their experience and tips. They ran an a/b test on their headlines with three variations: One with a question, one with a benefit, and one utilizing loss aversion. Three similar headlines on this page deliverd very different results. As you can see, the benefit headline (which spoke directly to it’s target reader’s dreams and aspirations) boosted conversions by 41.14%. The takeaway here? Focus on the benefit and writing amazing headlines. You may even have used something like that in the past. The thing is, social proof works. Studies show nearly 70 percent of online consumers look at a review prior to making a purchase and reviews are 12-times more trusted than product descriptions and sales copy from manufacturers. But, weak social proof can harm your conversion rates. Frankly, most customers will write a poor review or testimonial, though they mean well. Derek Halpern from Social Triggers actually increased conversion rates by 102% by removing social proof. So, use social proof. But, you’re probably better off writing a strong testimonial yourself. Then getting permission from your customer to say it matches their experience. This ensures it will work more in your favor. Pro Tip: Use exact numbers in your testimonials if you can. This works due to a principle in psychology known as Ambiguity Aversion, which states that humans prefer known risks over unknown risks (i.e. we like to know what we’re getting into). Robbie Richards does this well on his blog. Your testimonials should be written by you with the agreement of your customer. If you’ve ever written a paper in high school, your English teacher probably told you to write in “active” voice, not “passive” voice. Why? Because passive voice has a weak quality, is bland, and can be boring. Active language excites, energizes, and drives action. See what I did with the previous two sentences? It turns out that your English teacher was right. Here’s why. The company L’Axelle sells underarm sweat pads, and ran an A/B test on the product landing page. Their original page used passive headline attempting to integrate the benefit, “Feel fresh.” The second used direct language and strong verb “Put an end to sweat marks!” With language like this, the exclamation point is probably redundant. Version A of landing page with passive call to action. Version B of landing page with active call to action. That simple change in copy lead to a 93% increase in clicks, for a total conversion rate of 38.3%. It goes to show – landing page copy matters. Make your copy action-oriented. This seems so mundane and simple (and sometimes, it is). However, a simple change in the CTA button color can have surprisingly large effects on landing page conversion rates. A major eCommerce site that sells hand-painted porcelain wanted to grow their business (who doesn’t?). They decided to get Unbounce to help them out. Unbounce came in and made one super simple change: They made the “ADD TO CART” button green instead of blue. The result? A 35.81% increase in sales (yes, sales, not just clicks). Increasing the visibility of the call to action increased conversions. Now, why did this work? I don’t think it’s because green is a particularly compelling color. Changing the CTA color worked because the green gave the button some contrast. The blue didn’t stand out at all, whereas the green pops. Our focus, then, is not on particular colors being better for CTAs than others, but on ensuring a color contrast to draw the eye. 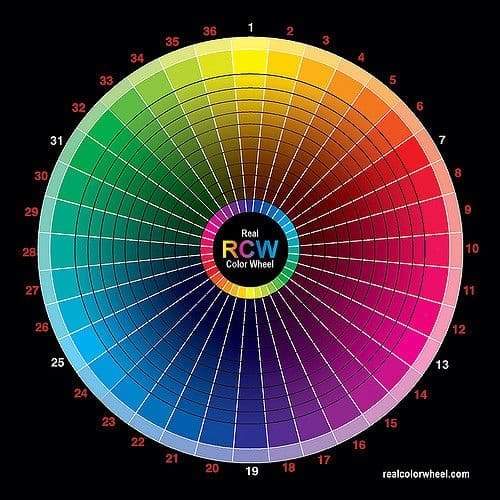 Designers use the color wheel to select complimentary–and conflicting–colors. In other words, if your main color is yellow, try a blue or purple CTA. If your main color is green, try a purple or red CTA. You had to have seen this coming – if action-oriented copy in your headlines and body increase click-thru rates, of course they’d work in your call to action (CTA) copy as well. The CTA is usually located on the button or link on which the visitor must click. WriteWork offers essays and writing guides for students. Their original checkout page CTA (shown below) simply said “Create My Account”. Who wants to create another account? 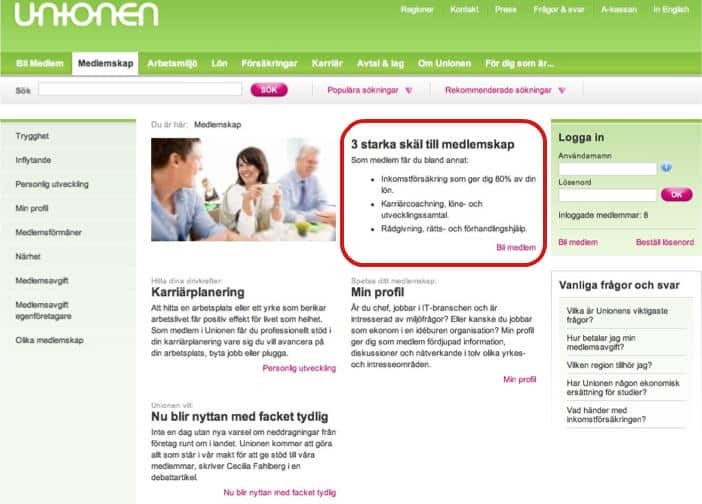 However, when they changed the text to say “Create Account & Get Started”, they saw a nice 31.03% increase in conversions. Not too shabby, eh? New call to action copy deliverd a significant conversion increase in this test. The verdict? Make your CTA copy actionable, and tell your customer exactly what will happen when they click it. The human brain is very drawn to faces and eyes. We have a tendency to look at faces before anything else on a web page. This can be a good thing… or it can hurt conversions. When it comes to using faces on a landing page, they can add credibility and trust. However, they can also distract the reader from a message or CTA. To get around this, only use faces of people the user is bound to recognize and trust (such as an authority in your industry) near CTAs. For maximum effect, have them looking at, and potentially even pointing to, your CTA. Of course, you still want to put pictures of you and your team to help build trust – just don’t place them near the call-to-action. In a case study, Medalia Art was able to boost clicks 95.4% by replacing the images of art on their home page to images of the artists. 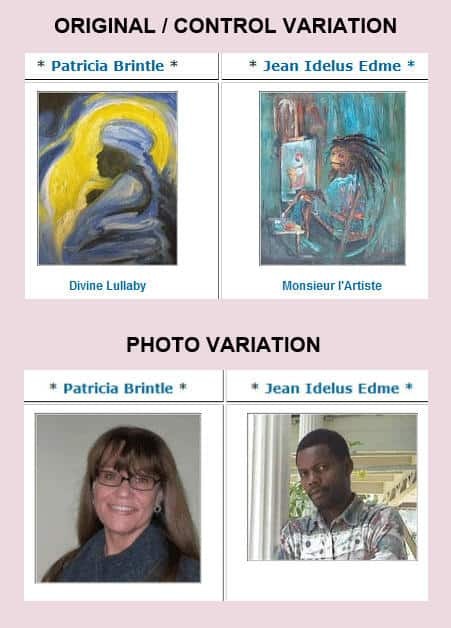 The images of the artists increased conversions in this art case study. Just as formatting makes your blog posts more engaging, so too does formatting make your landing pages easier to navigate and understand. What do I mean by formatting? Use bulleted lists to state your key benefits. Use images to give the eyes a rest from reading text. Utilize white space to avoid extra noise and distraction. Include headings and subheadings to break up your page. Use directional cues (like arrows) to point the viewer’s eyes to your CTA. Great formatting makes your landing page easier to skim–and you know most of your visitors are only going to skim–making the most important points immediately apparent. Just as people prefer better-looking people, people prefer better-looking websites because they associate beauty with perceived trust and credibility. Want an example? 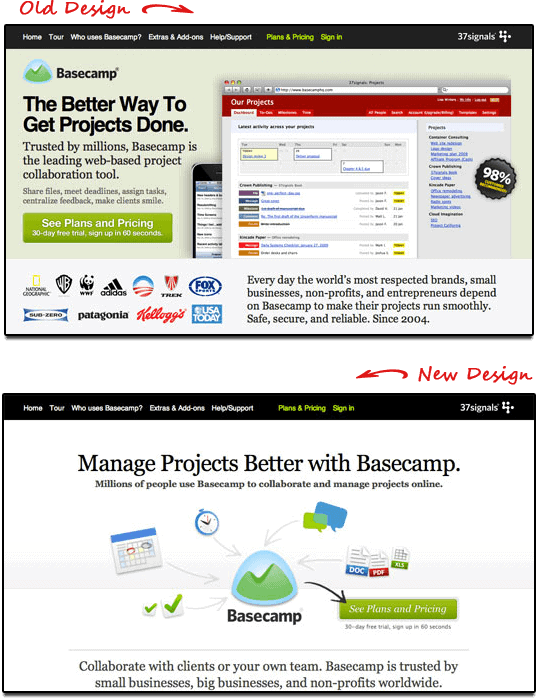 Basecamp redesigned their landing page and found a 14% increase in conversions. Basecamp tested formatting in this landing page AB test. Version A: A big block of text at the key call to action. 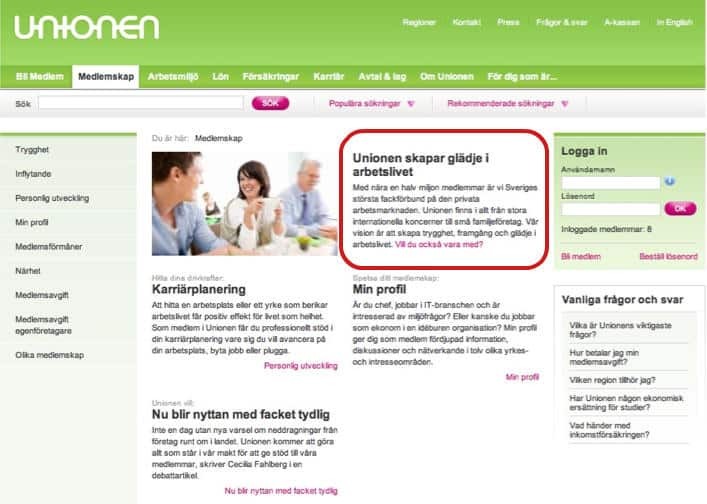 Version B: You don’t have to read Swedish to know that bulleted text and white space wins. Having grammatical or spelling errors in your copy can seriously hurt conversion rates. It makes you appear unprofessional at best, and like a scam at worst. Want a real-life example of how badly a small mistake can harm your business? Take a look at this case study from Practical Ecommerce on a website selling tights – correcting their spelling from “tihgts” to “tights” on their product category page shot conversions up 80%. Bad spelling can destroy visitor trust. In a world where tools like Grammarly and built-in spell checkers exist, there’s just no excuse not to have immaculate grammar and spelling. Take an extra ten minutes to read through your page to ensure no errors get though. Pro Tip: I actually like to read my writing out loud at least once. This helps me catch any errors and get a better idea of the flow and overall sound of things. Multiple CTAs?! Are you crazy? Before you scroll down and leave me a nasty comment, hear me out. I’m not talking about having a variety of buttons and forms leading to different places. Rather, on longer pages, you should have multiple buttons and/or opt in forms that lead to the same outcome. Having more than one chance for the customer to opt in allows them to scroll through and click at their own pace. If they don’t click your above-the-fold CTA, for example, they’ll have another chance in the middle or at the end of the article. That said, too many buttons can cause your visitors to get decision fatigue, becoming tired of too many choices and leaving the page. So, short rule of thumb? Place multiple CTAs on long pages, and a single one on short pages. One of the 21 persuasion techniques for conversion optimization was something called the “Hobson’s +1 choice effect”. This effect essentially states that having over two choices can cause anxiety and negative feelings, but we also want to have the choice to choose. As such, if you only have one option on your landing page (the CTA), adding a “Tweet this” button can help, according the the choice effect. However, if you already have multiple offers, CTAs, or links in your offer, social buttons can add to the noise and reduce conversions. In one case from Taloon.com, removing social sharing buttons from their product pages increased conversions by 11.9%. Removing social sharing buttons increased conversion rate. They had four social sharing buttons instead of one (like “Share this product” or “Tweet this”), creating too many distractions. They also have many other choices on these pages, like clicking to a separate category or page on the website, putting them well above that ideal two-choice limit. I’ve already said it, but I’ll say it again: you have to test these things to find out exactly what works for your product, audience, and business. Purchasing is an emotional decision, which is then backed by logic. Therefore, once you’ve sold someone emotionally on your product or service, you must then provide them with logical reasons to actually get through the checkout page. One way you can do that is to highlight your guarantees. A money-back guarantee is an amazing way to get people to commit. It’s truly risk-free. If they don’t like it, they can get their money back. Neil Patel increased sales of his Traffic System course by 21% when he highlighted a 30-day money back guarantee. A low-price guarantee (where you’ll refund them if they find a higher price). A forever guarantee (where you’ll replace the product for life). Don’t be afraid to test different guarantees, just as you we talked about testing different offers. 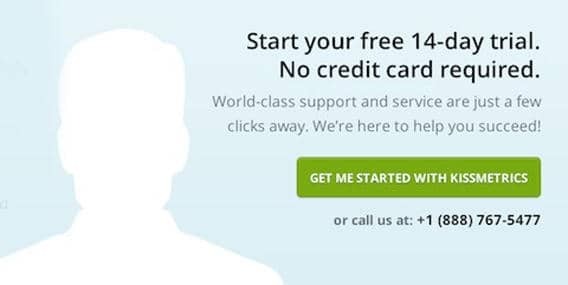 You may find a free trial–a $1 trial to avoid credit card complications–converts better than the money back guarantee. Pro Tip: Another way to build trust is by adding an SSL certificate to your site. That’s the green lock that says “secure” next to it. This shows your visitors their information is safe. The inverted pyramid is a writing style coined by journalists. It means keeping all of the key benefits and most important takeaways at the top of the page, then getting into the details as you get further down the page. The structure of the inverted funnel. So, your attention-grabbing claims and statistics should be used at the top of the page to get visitors engaged, then your body copy, as you go down the page, should build anticipation for your product, at which point you give your CTA. 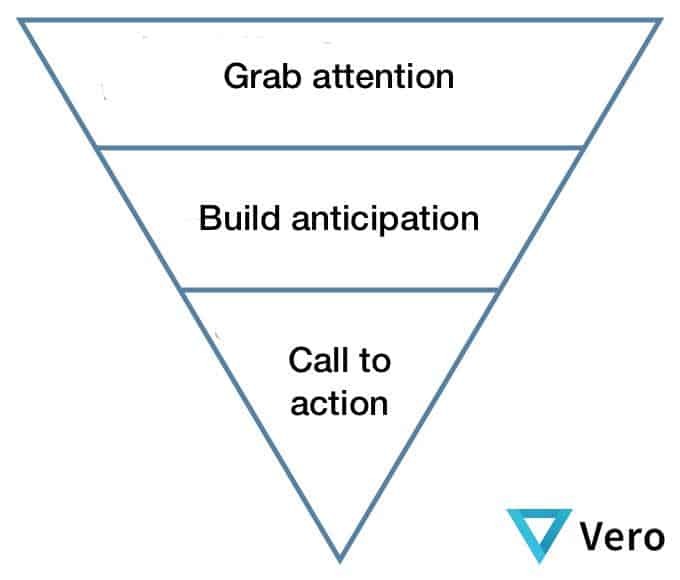 Of course, not all landing pages will be long enough to use the inverted pyramid method, but for longer pages it works wonders. Afterall, only about half of all your visitors will ever even reach the bottom of your account – you need to entice them. 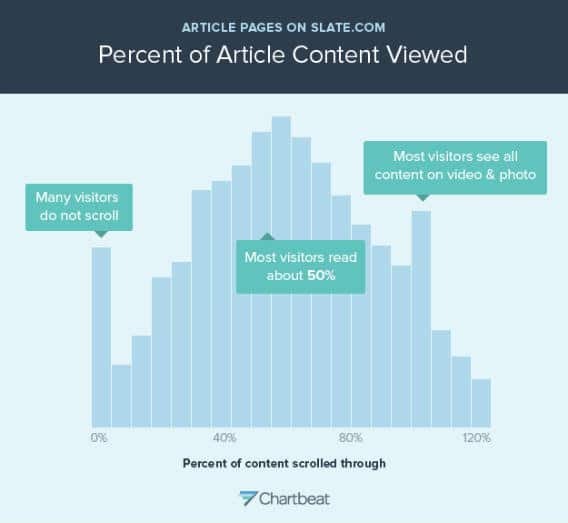 Percent of article content viewed. Use the other best practices mentioned in this post, like formatting and imagery, to ensure you have the most important stuff first. Images aren’t just for formatting. They can be used to convey your main benefits and to help users understand what your product or service is about. One study by eyeviewdigital.com even found that using video on landing pages can increase conversions by 80%. Check out their case studies if you’re interested in learning more. Don’t overuse them. White space is your friend. Make the images relevant. Stock photos usually work against you. If you’re in need of some images to add to your site, check out Unsplash. They have free high-res photos anyone can use. You can also use a tool like Canva to edit the images. For free. 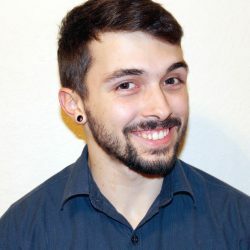 Check out KISSmetric’s guide to creating unique landing page videos for more help on the video side of things. However, with only 16% of all landing pages following this practice, does it really work? HubSpot tested it to find out. They created two landing pages: One with a navbar, social sharing links, and footer, and one without any of the three. Navigation should not be necessary on a complete landing page. In this case study, navigation hurt conversions on most pages or didn’t help at all. In other words, it’s worth a shot to remove extra links. It may not always work, and it may not be worth losing the clicks to other parts of your website, but it had potential to increase sign-ups. The first job of the landing page is to keep the promise made in an ad, email, social post or link. Any variation can cost you conversions. Consistency is key to a great many things, from blogging to getting fit. It’s necessary to succeed, and people love seeing it. In the first one, the Headline was kept the same, regardless of the ad copy they used. In the second test, they matched the landing page headline to the ad copy. Test A: One landing page attempts to keep three different promises. Unsuccessfully. Test B: These landing pages keep the specific promises made in each add. The results? 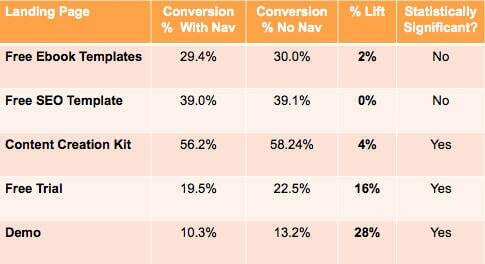 A 39.1% increase in conversions. Match the colors of your ad/brand with your landing page. Use similar images and design. Use similar (and even an exact match) of your ad copy on your landing page. Keeping things consistent ensures people aren’t confused when navigating your site, and they know get what they expected to get when they click your ads. One of the landing page best practices you often hear is to reduce the number of form fields as much as possible. It’s true, this reduces friction for the customer and has been shown to increase conversion rates. BUT (there’s always a catch, isn’t there? ), asking for more information better qualifies your leads and, in many cases, shows them you’re actually capturing the information needed. 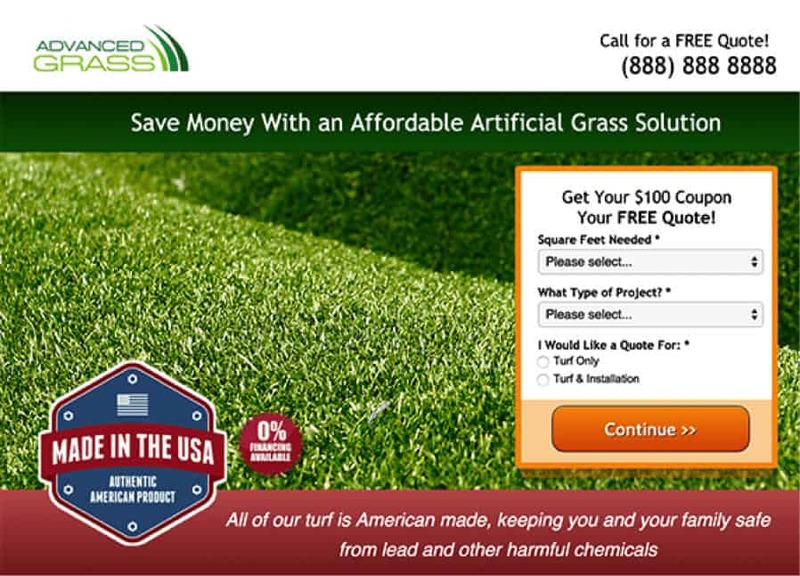 Advanced Grass is an artificial grass solution. 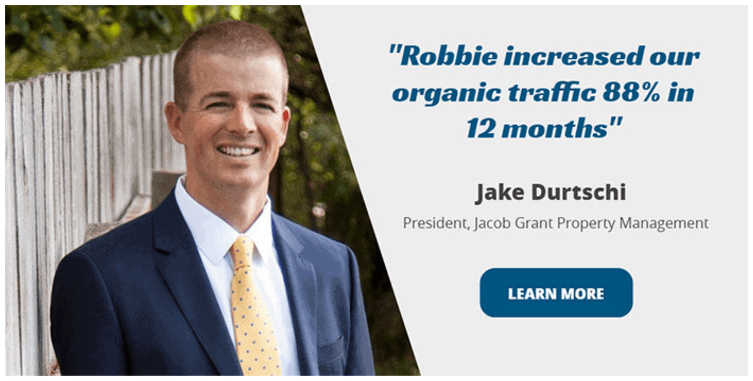 They were able to achieve a 214% increase in conversions by splitting up their lengthy opt-in form into two parts: contact information and qualifying information. Part 1 of the multi-step lead generation form. Part 2 of the multi-step lead generation form. By simply splitting their form into two parts, they are taking advantage of the psychological principle of commitment and consistency, well known in the marketing world thanks to Dr. Robert Cialdini’s book Influence: The Psychology of Persuasion. Basically, Cialdini found that people are more likely to take additional steps towards something if they’ve already committed to the first step. 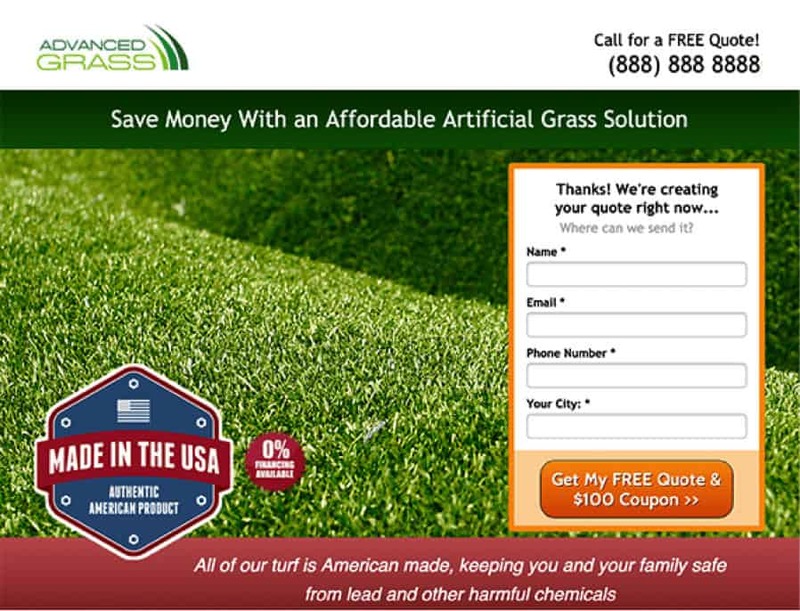 In the case of advanced grass, they already committed to entering their contact info, so they’re more likely to enter the few extra details. Additionally, asking for the right information builds trust. How could you give an accurate quote for your artificial grass if the company didn’t know how many square feet you need or what kind of project it is? The bottom line? Ask for more info, but split your form into two steps. #17: 10X clicks by testing different offers. Sometimes in our landing pages, we’re focusing on entirely the wrong offer. Maybe people don’t want a ‘free trial’ or ‘free consultation’. What about a free eBook or a free tool, instead? I didn’t pull those examples out of my you-know-where. WordStream actually increased conversions 10 times over by changing their offer from a “Free Trial” of their software to giving away a free tool they created: The Google AdWords Performance Grader. WordStream found success by changing their offers. A free case study detailing how others have used your software to maximize their business. A template or worksheet helping your visitors accomplish something specific. The key is to offer something highly relevant to what your software does and that’s very valuable, meaning you didn’t slop it together in five minutes. Put some thought into it. If you’ve been building landing pages for any amount of time, you’ve surely heard of using scarcity as a tactic to increase sign ups. Using scarcity means limiting resources in order to get your visitors to take action right away. For example, putting an expiration date on a coupon, limiting an offer to a certain number of customers, and announcing that you only have a few items left in stock are all versions of scarcity. Going back to Cialdini, scarcity is one of his psychological principles of persuasion. 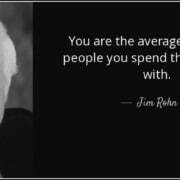 People place more value on that which is limited. Hiten Shah decided to reduce the free trial period from 30 days to 14 days – and he found a 102% boost in engagement. In other words, twice as many people took action and used the free trial during the 14 days than the 30 days. More people signed up during the 14-day free trial than the 30-day trial. So, use scarcity on your own pages by including a countdown timer on your page or offering a limited number of products. You think I’m going to tell you to put your CTA above the fold, don’t you? Well, you shouldn’t necessarily do that. This is one of the most common of landing page best practices. Instead, pay attention to the fold. While there is research that supports above-the-fold CTA, there is research against it as well. 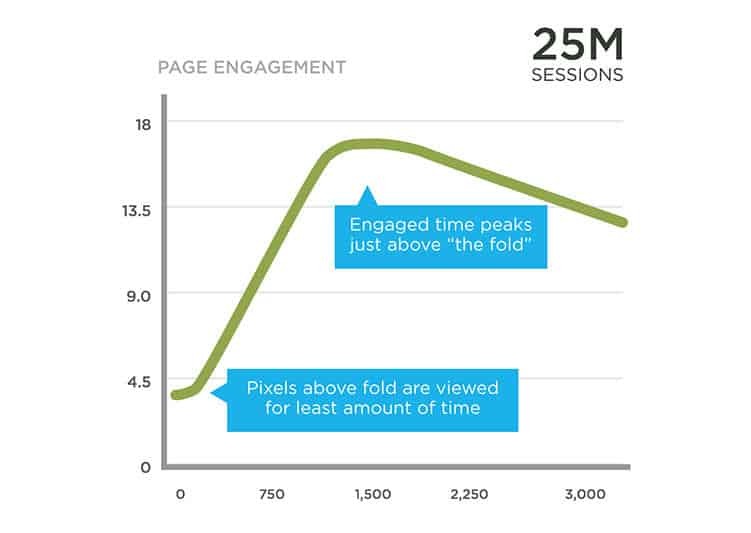 Most engagement happens right at the fold or just below it. As you can see in the chart above, people view the topmost area of the page the least, and view the area “just above the fold” the most (i.e. right where you begin to need to scroll). So, where should you really place your opt-in form or CTA? 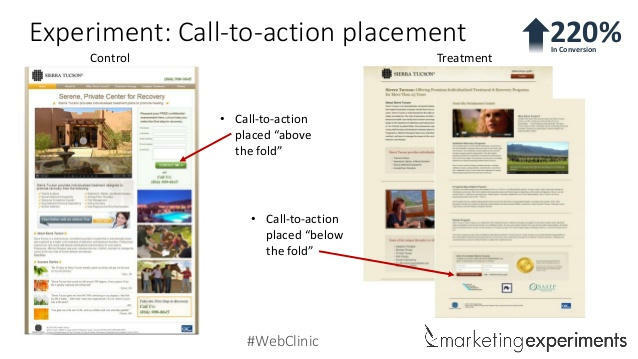 Offer complexity affects the placement of your call to action on the page. Let me give you a more direct example. 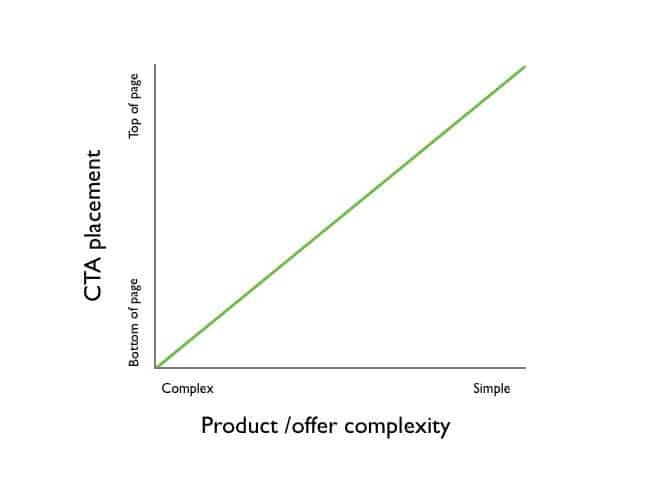 Marketing Experiments tested one of their client’s CTA placements above- and below-the-fold. Below-the-fold actually resulted in 220% more conversions, likely due to the complexity of their product. In this case, placing the call to action near the bottom of the page increased conversions. What did we learn? Above-the-fold isn’t always best – test your CTA placement. 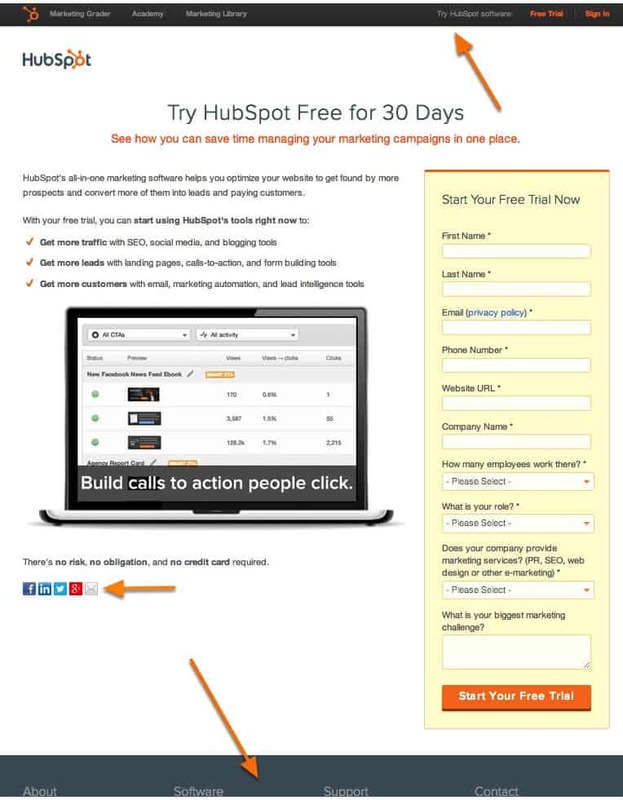 #20: Don’t rely on these landing page best practices. Test. All of the best practices on this list can (and probably have) been broken with exceptions at one point or another. Like I said in the very beginning of this post – best practices make a lot of assumptions. Use them, but don’t be afraid to go against them. I’ll leave you with one final case study to prove just how important it is to a/b test your landing pages. Convert Verve, who’s examples you saw in some of the practices above, ran a simple test on the checkout page of one of their clients – removing the green arrow pointing to their CTA button. As it turns out, removing that green arrow actually reduced conversion rates by 12.29%. Who would have thought? Of course, if you followed along above, it makes sense – removing the arrow reduces the chance for the button to draw the eye. Removing the arrow reduced conversion. So, in parting: Always test your landing pages, and don’t be afraid to go against best practices once in awhile. Landing page best practices are just that – best practices. We can take what’s worked for others and copy it for our own use, but ultimately, it comes down to trying different things. As Mark Zuckerberg says, “Move fast and break things.” Follow expert advice to make your first page the best it can be, then start experimenting. Now, what did I miss? There are surely more landing page tips & tricks out there I didn’t cover here. Drop me a comment and let me know. And, if you found even one thing useful about this article, please take a moment to share it.